Clear your calendar to experience the most brilliant GNSS and Earth observation applications and solutions at this year’s Satellite Masters Conference in Madrid, Spain 25-27 October. It incorporates the Awards Ceremony of Europe’s major ideas competitions for commercial space applications – the European Satellite Navigation Competition (ESNC) and the Copernicus Masters – as well as the Horizon 2020 Space Info Day. All together, these three innovation gear wheels form the year’s leading space event for groundbreaking space-based applications. The Satellite Masters Conference kicks off with the business roundtable including high-level panellists and decision-makers from leading European institutions and industry. This high-ranked roundtable discussion is followed by the festive Awards Ceremony of the ESNC and the Copernicus Masters – honouring the most cutting-edge and promising space-based services, products, and business cases. The Awards Ceremony is co-organised by the local ESNC partners of the Madrid Challenge – madri+d and the Comunidad de Madrid. Day two of visionary event for forward-looking space applications is dedicated to various progressive focus sessions, inspiring keynote speakers and panellists as well as elevator pitch presentations of the winners of the ESNC and the Copernicus Masters 2016. The Horizon 2020 Space Info Day rounds off the Satellite Masters Conference on 27 October with informative presentations and first-hand insights from European representatives on the 2017 calls. Furthermore, this day showcases useful advice on how to find business partners and prepare successful proposals. AZO announces the first confirmed high-level speakers including: Dr Josef Aschbacher, Director of Earth Observation Programmes European Space Agency (ESA); Dorothee Bär, State Secretary, German Federal Ministry of Transport and Digital Infrastructure (BMVI); Juan Carlos Cortés, Director of International Programmes, CDTI; Christoph Kautz, Deputy Head of Unit Galileo & EGNOS Applications, Security, International Cooperation, DG for Internal Market, Industry, Entrepreneurship and SMEs, European Commission (EC); Dr Jurry de la Mar, Account Director T-Systems; Jörg Migende, Head of Smart Farming and Internationalisation Agri-Services, BayWa; Uli W. Fricke, Managing General Partner (CEO) Triangle Venture Capital Group; Candace Johnson, President EBAN; Markku Markkula, President of the European Committee of the Regions (CoR); Stuart Martin, Chief Executive Officer Satellite Applications Catapult; Jorge Potti, General Manager, Aerospace, GMV; Andreas Veispak, Head of Unit I3 Space Data for Societal Challenges and Growth European Commission (EC); Javier Ventura Traveset, GNSS Senior Advisor European Space Agency (ESA); Thorsten Rudolph, Managing Director Anwendungszentrum GmbH Oberpfaffenhofen (AZO). Explore the comprehensive programme of the Satellite Masters Conference. Next to the multiple renowned speakers, it features dedicated future-oriented focus sessions, exciting roundtable discussions, details on the festive Awards Ceremony and unique chances for networking. 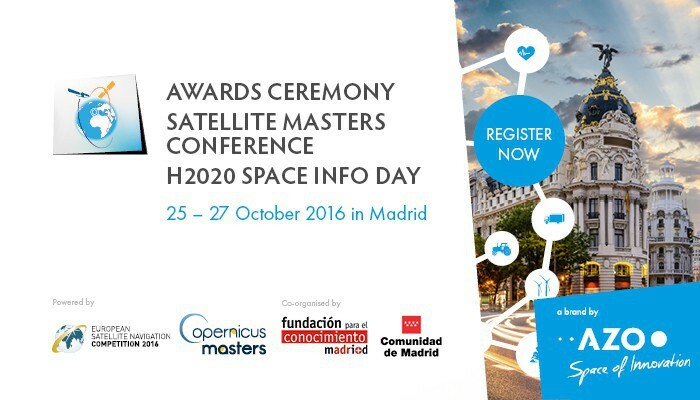 Join the Satellite Masters Conference to discover the most promising applications 2016 which make use of Europe’s flagship space programmes Galileo, EGNOS and Copernicus.